With a Bluetooth option, the UC-351PBT-Ci offers precise readings and more functionality than many traditional scales. This scale measures your weight accurately within 2/10 of a pound and even recognizes small increases or decreases to your weight. It's ideal for those who are targeting weight loss and for athletics and diabetics who want to keep careful watch of their weight. 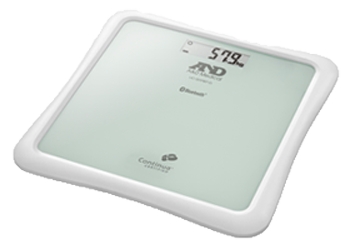 In addition, the scale has step-on technology in which it automatically turns on and turns itself off for easy use. Holding up to 330lbs (150kg), this low profile scale can display your weight in either pounds or kilograms. It is also equipped with audible buzzers and visual indicators to let you know when to get on and off.